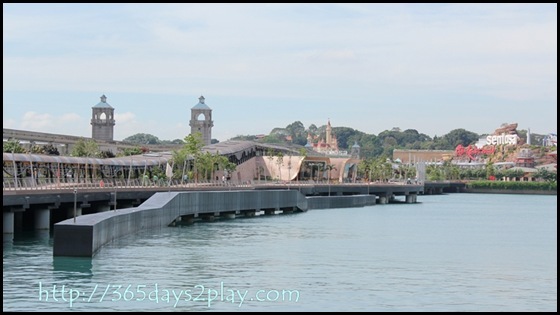 Finally managed to find some time to go check out the new Sentosa Boardwalk. It really felt as if we were tourists in Singapore, with our hats, sunglasses, sunblock and camera. 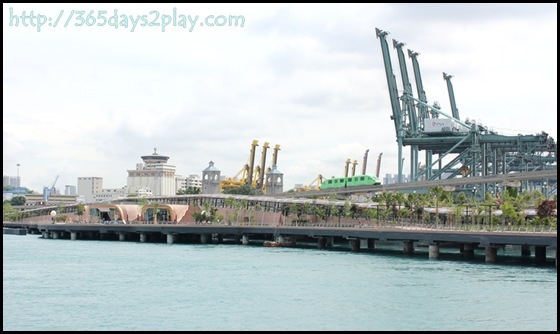 As you know, there is the vehicular bridge linking mainland Singapore to the island of Sentosa. There is also a footpath running the length of that bridge as well, and has been in existence since forever. The Boardwalk isn’t on the bridge itself. You can see from the pictures below that the boardwalk is on ground level. It runs parallel to Sentosa’s vehicular bridge and offers an experiential walk amid lush landscapes. 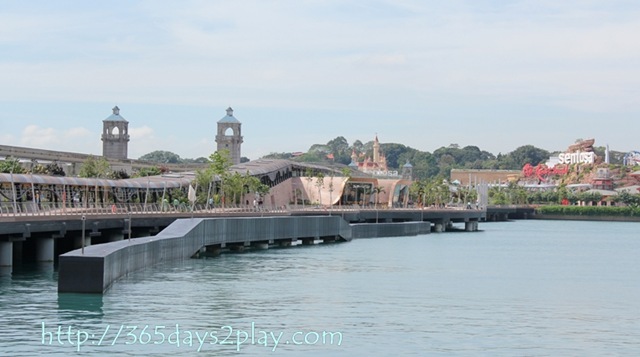 It is the only garden-themed boardwalk in South-East Asia, and features five tropical landscapes that are indigenous to Singapore. 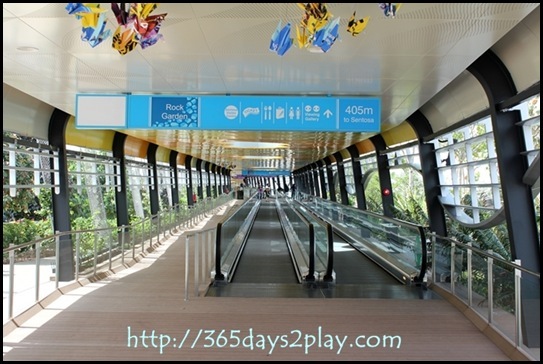 I was amazed to find out that there are travelators almost the entire way. 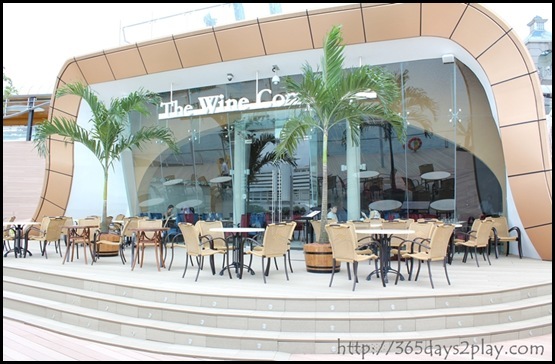 It seems like a luxury, but trust me, you don’t really want to be walking the entire distance (more than half a kilometre) under the hot Singapore sun. The travelators were great. We spent our energies looking at the scenery. 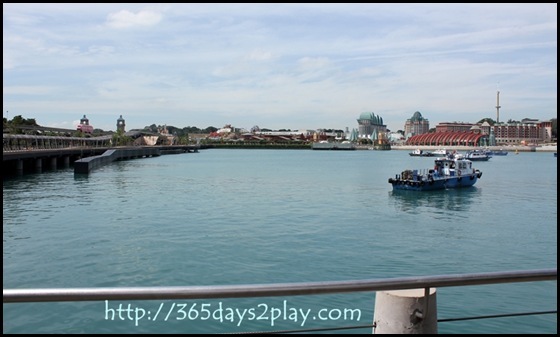 Huge cruise vessels parked at HarbourFront, Vivocity and the Resorts World Sentosa. The mechanical cranes were also there, but sleeping. I don’t really think I would fancy watching mechanical cranes doing their dance performance at night, it looks weird and scary if you ask me. 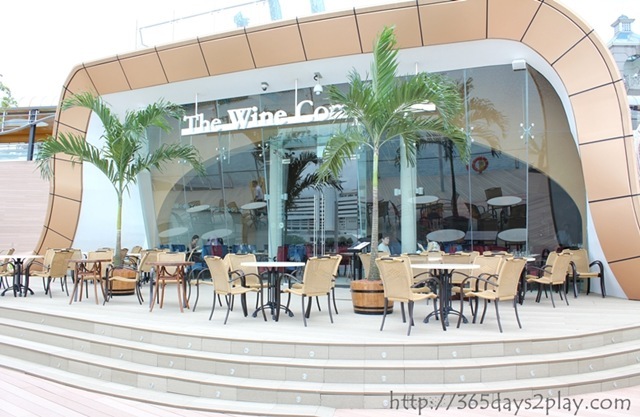 Apart from taking you from the Vivocity side to the Resorts World Sentosa side, there are also 3 F&B outlets (2 restaurants, 1 ice-cream shop – Gelateria Venezia) and 1 retail shop, as far as I can recall. Apart from these, and stopping to admire the view, there isn’t that much to do there. It may actually be a better idea to go at night, then at least you can enjoy the crane show as well as the beautiful lights at night. 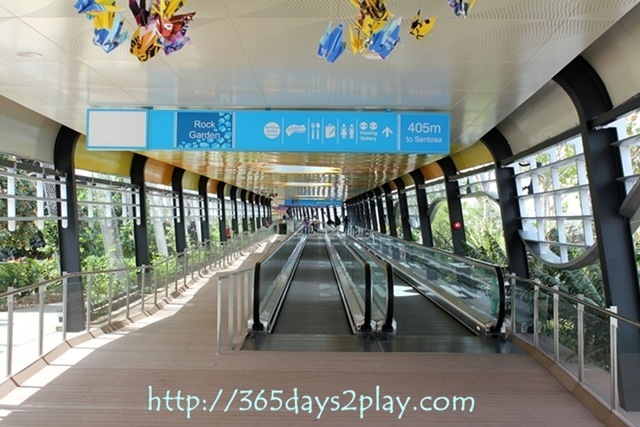 Sentosa Boardwalk is also having a carnival of sorts called Footsteps to Fun 13, 18-19 March 2011. Check out their Facebook and click on like to win prizes! 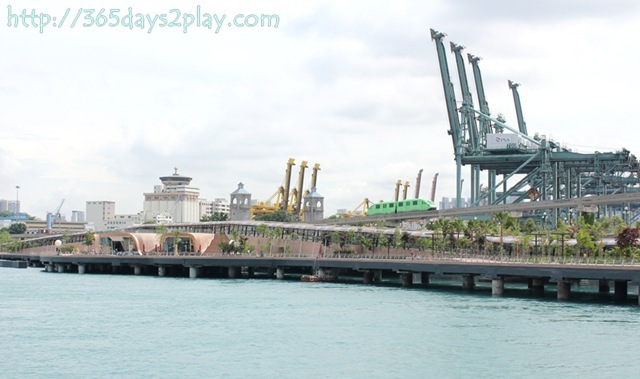 At the end of the Sentosa Boardwalk, it costs $1 for entry into Sentosa. 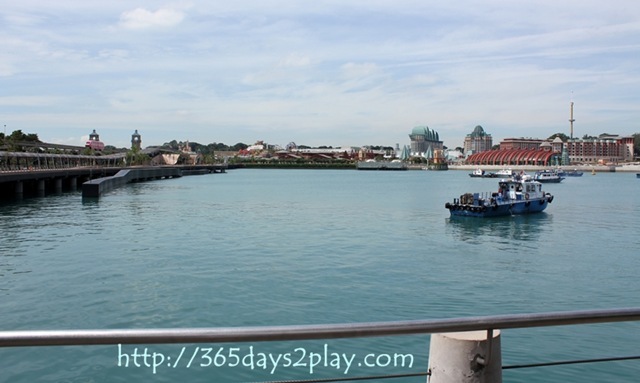 Resorts World Sentosa and Universal Studios are what you will find first if you venture in. The place is pretty huge so make sure you have stamina to navigate the area before you enter. It’s still 5 – 10 minutes to get to the F&B area at Resorts World. The travelators remind of the airport. 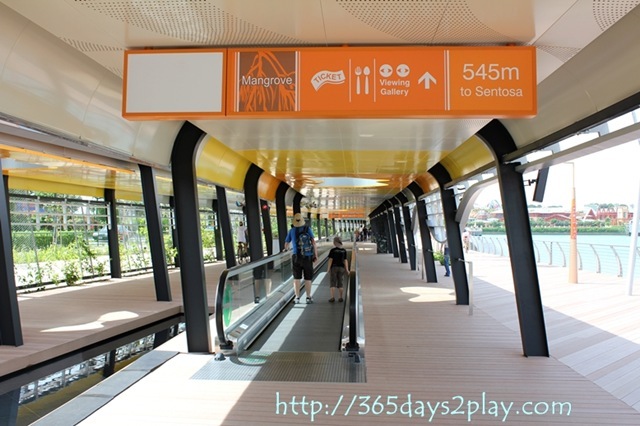 Would love to check out this new feature at Sentosa. It’s great that you always entice us the latest places to explore. Especially when I run out of ideas and feel bored during the weekends.